These are my goals for this year 2013. And in order to accomplish these, there must be some 'must-haves' things in order to help me. Good thing I don't need to search too far. 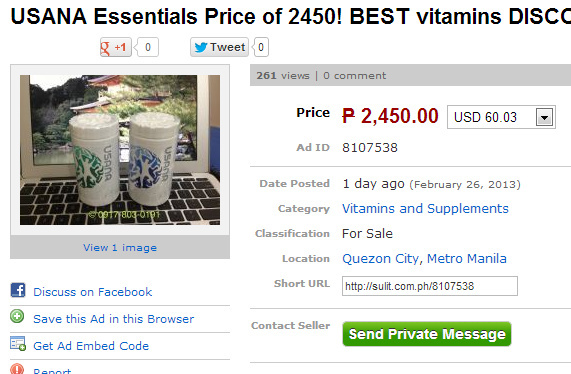 All I need to do is visit Sulit.com.ph, the Philippines' #1 classified ads website, where you can find almost anything! 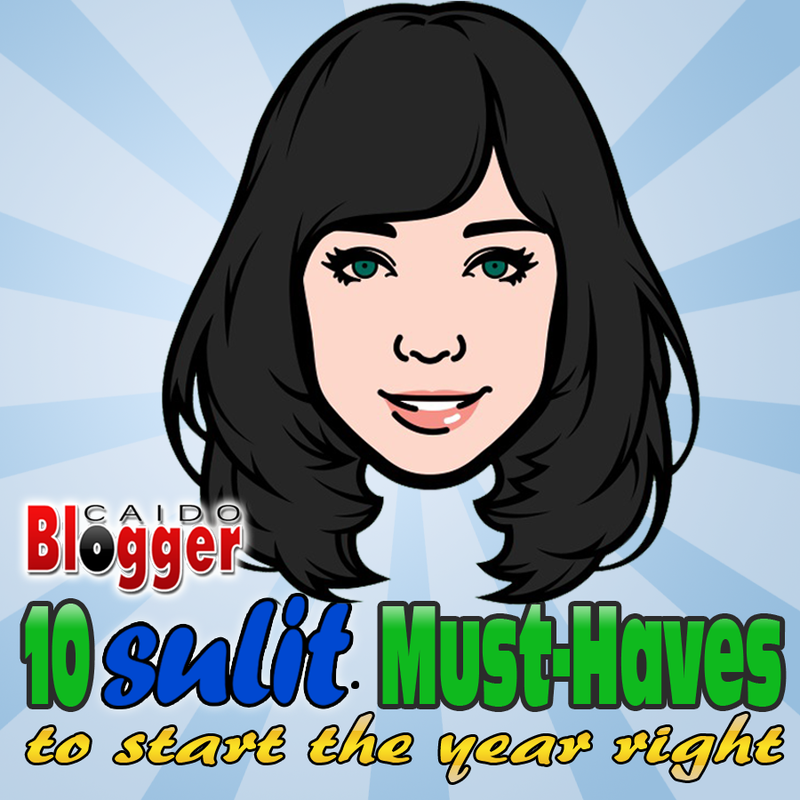 So to start the year right, I'm starting it with Sulit.com.ph, not just for finding the good deals but also by joining this blog contest (sponsored by Sulit), listing my 10 Sulit must-haves in order to start the year right. One blogger will win P50,000 worth of Sulit GCs and also 5 lucky readers of the winning blogger will win P10,000 GCs each. Not bad to start the year, right? 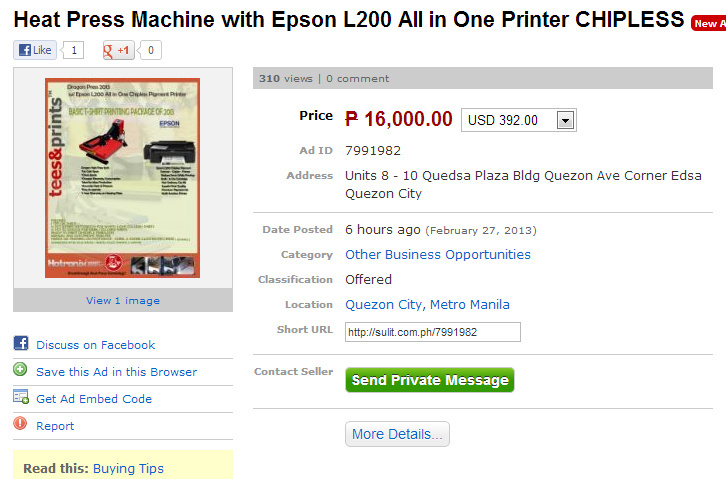 If you want to join to win P10K GCs, just read the instructions how at the bottom of this post. 1. USANA Essentials - I want to start the year right being healthy. Late last year, I was hospitalized. And being hospitalized equals gastos. Not so sulit so I don't want it to happen again. That's why I need to be more healthy. To live more and start the year right, I need to take good care of my health. Eating the proper foods sometimes is not enough. So I need some supplements. And this is a very good one. 2. AMD A10 Trinity - I want to upgrade my PC because it's already too sloooowww, it can no longer run some of the applications properly, thus I could not do what I needed to accomplish. With this latest AMD processor, I could do more because it is an Accelerated Processing Unit (APU), a quad-core CPU and AMD Radeon™ Graphics combined on a single chip for accelerated performance and blazing fast computing. 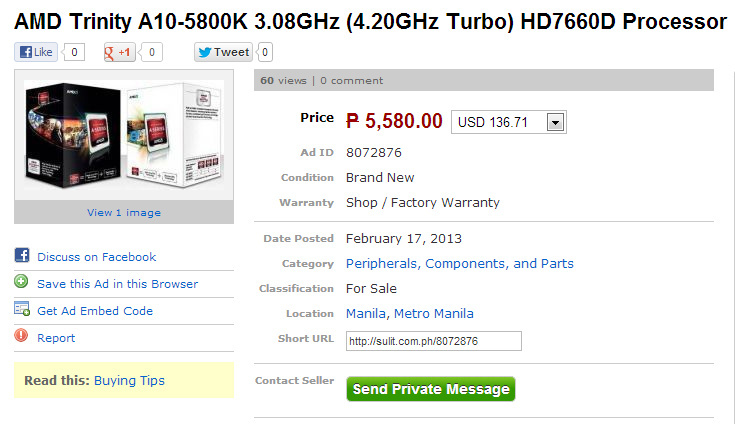 Also with this, I will no longer need to buy a separate graphics card. 3. 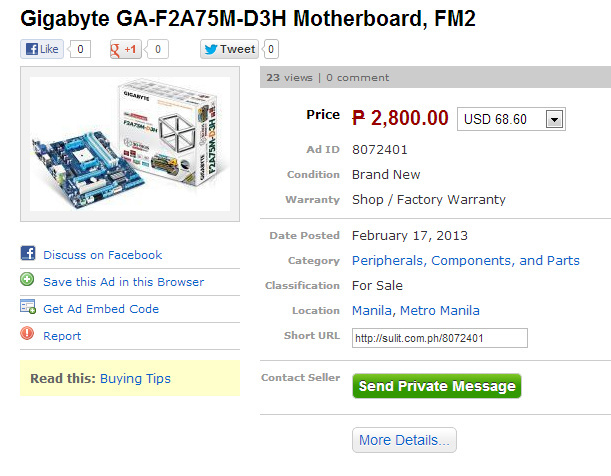 Gigabyte MotherBoard - Since I'll be upgrading to AMD A10 Trinity, then a new motherboard compatible with the said processor is a must. 4. Seagate 2.5 Expansion Basic External Hard Drive USB 3.0 1TB - My storage drive is almost full, and I wanted a larger storage for all my files that I could bring wherever I may go. And this one would be perfect. 5. 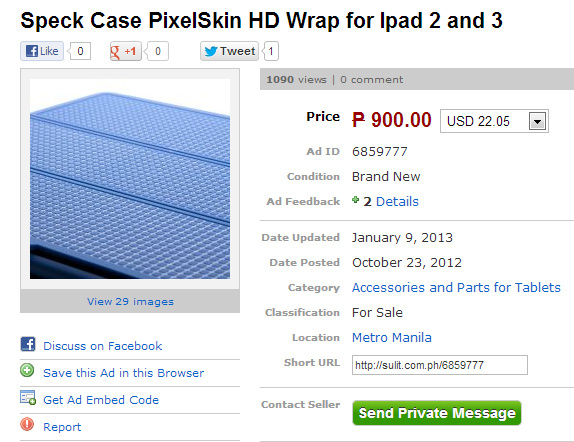 Speck Case PixelSkin HD Wrap for Ipad 2 - Remember the iPad 2 that I have won from Sulit? Yes, it's still alive, very much functioning and very much useful. Since it has this sentimental value for me, I need a sturdier case for it so that I could use it even for the longest time possible. 6. Xperia Mini Case - My Sony Ericsson Xperia Mini is the first cellphone that my blogging have bought and I have been using it as my portable WiFi router. It's almost a year since I have bought it, but until now, I still don't have a protective case for it. A bit clumsy person that I am, this indeed is a must-have. 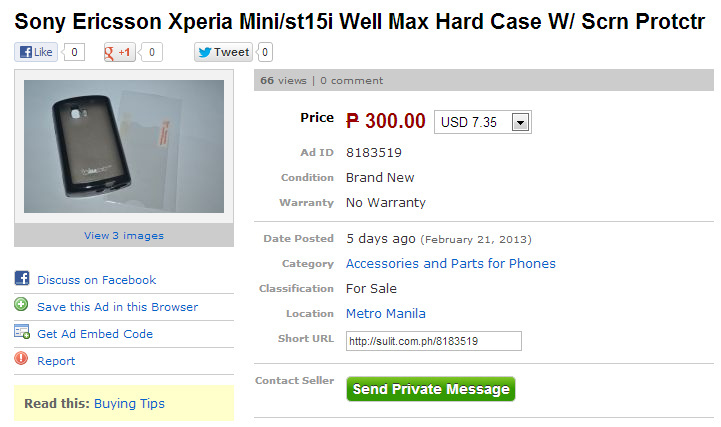 I have been looking here in some nearby cellphone stores, but they don't have cases for Xperia Mini. 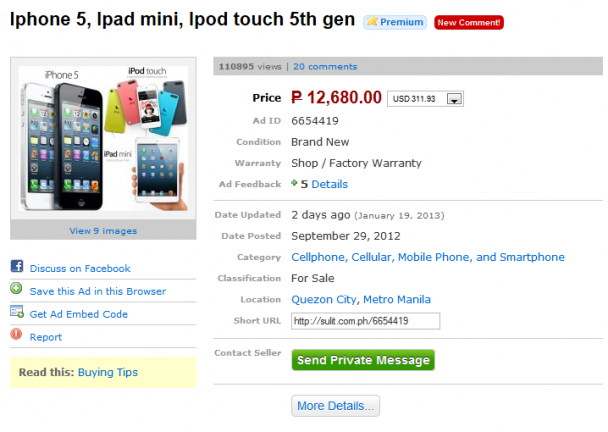 Good thing you can find it at Sulit.com.ph, with a matching screen protector pa! 7. 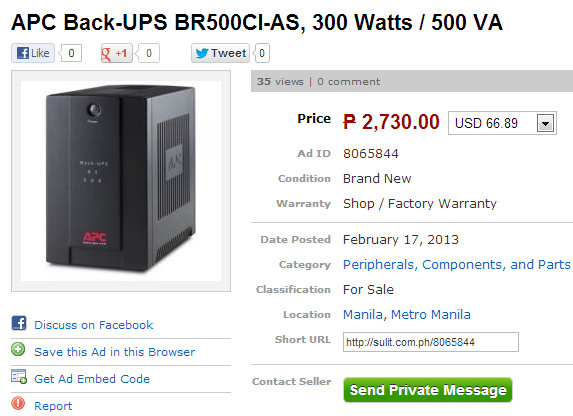 APC UPS - While I was writing this post, Brownout suddenly came without notice, causing my computer to shut off, and leaving me in darkness of a second. My old UPS is not working anymore, so I was not able to save what I was doing. So in order to avoid this in the near future (with my upgraded PC), a new UPS is also a must. 8. Traveling Bag/Luggage - I have a scheduled trip this April and I still don't have a bag for all my stuffs that I needed to bring. 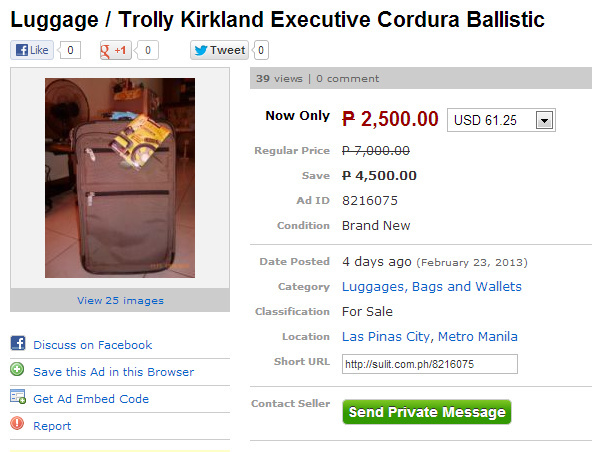 I have been looking for a travelling bag that is something sturdy yet not too expensive, just right on my budget. 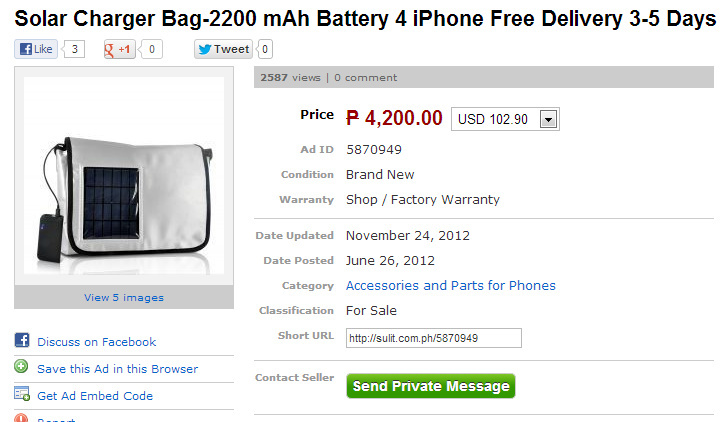 And the bag posted on Sulit.com.ph (see below) is what I have been looking for. 9. Solar Charger Bag - I want to travel more this year, going to places I have never been before, and of course with some of my gadgets in tow. So this dual purpose bag, a solar charger bag, will really be helpful and convenient for charging needs. 10. Heat Press Machine with Epson L200 - One of my sidelines online is making shirt designs (here). But until now, I have not yet wore any of my designs, and I would love if I could wear my own designs. That's why I want to learn how to print on T-shirts. I been thinking to start this new business venture, and I think this Heat Press Machine bundled with Epson L200 printer is something good to start with. Over-all, all these items that will help me to live more, do more, travel more, learn more and earn more will cost me just below P50K. 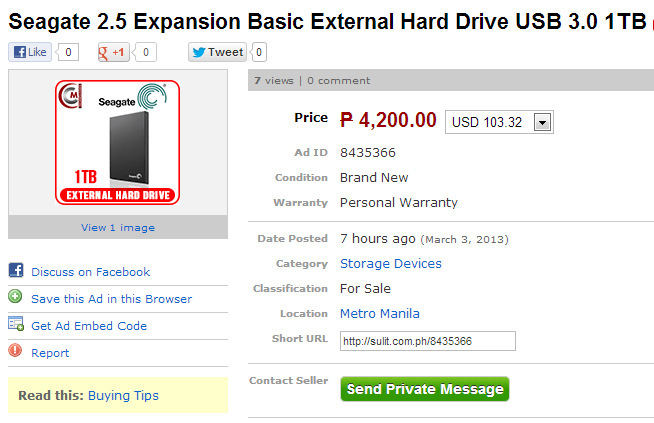 Only P39,680.00 to be exact. It will really be sulit. 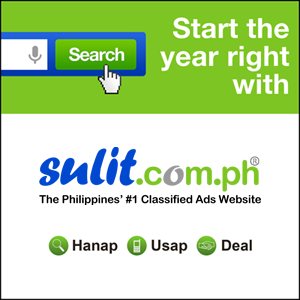 So want to win P10,000 worth of Sulit.com.ph GC’s and start your year right? 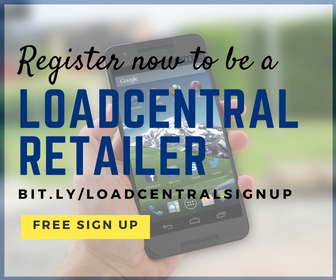 Already left a comment? (If not yet, scroll down and post your 10 sulit must-haves on "Post a Comment" section below). So, what's next? PRAY. And WAIT. ^_^ If this blog entry wins, then 5 of my lucky readers will get a chance to win P10,000 GCs to start our year more right. Good luck to us all!